Not all is good in the house of Tomb Raider. Colin S. sees some troubling cracks in what many call a strong female lead. In gaming, the gameplay’s the thing – or so you might think from critics’, gamers’, and developers’ emphasis on the fun factor, the rush. Gameplay’s important but the real source of gaming’s power is what great gameplay implies: personal agency. The player’s personal agency, to make meaningful decisions that influence the situation for one’s own ends, not to act on impulse but to choose to act, to reason – that’s what separates gaming from other fictional entertainment media. It’s a balancing act for developers. Give your player too much power, too much control, and drama turns to farce – which is fine, if you’re making Saints’ Row IV; not fine if you’re making The Walking Dead or The Last of Us. Give your player too little power, and you end up with a walking simulator – again, great if you’re making a story-heavy, atmospheric, narrative-focused game such as Gone Home or Outlast; not great for an action game like DOOM or an adventure-thriller like Tomb Raider or Rise of the Tomb Raider. Tomb Raider (2012) deserved the acclaim it received for technical accomplishments. That said, I’m puzzled by the love for its characters and story. As the most visible heroine in gaming, Lara Croft should be a badass – and for most of the reboot, she isn’t. Rather, she’s girlish, her own cheerleader yet plagued by self-doubt and petty preoccupations, who wouldn’t even be alive, had a man not literally rescued her from drowning. I see what Square Enix and Crystal Dynamics wanted to do. They wanted to make it an origin story. No, starting out, she isn’t a badass… not yet. By the game’s bloody undead-samurai-slaying finale, though, she has fulfilled her potential – and in no uncertain terms, either. “A Survivor is Born,” proclaims the final shot. 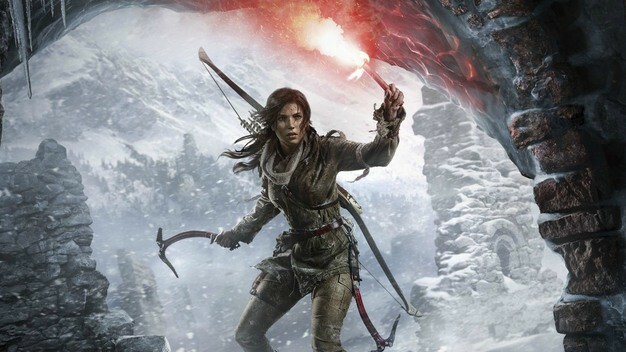 Ignoring the implication that the first game’s action takes place in some wilderness-like womb and storm-battered birth canal, we must conclude that, henceforth, Lara the Survivor is a bona fide badass. Nope. It turns out, Lara the “survivor” is virtually identical to “daddy issues” Lara. What does it matter if Rise‘s Lara’s regression of character makes no sense in the series’ chronology? Did audiences really need to know why Reese Witherspoon’s blondeness, latent at the end of the first movie, suddenly, inexplicably returned in Legally Blonde 2: Red, White, and Blonde? No. Is that question an instance of false equivalence, designed to introduce the bimbo-savant archetype into discussion? You bet. I want you to picture another reboot of the Tomb Raider franchise. Now, fire Lara, daddy’s girl with the can-do spirit and the heart of gold – -and hire The Last of Us’s Tess, instead; Tess is a character who chooses when to shoot, who goes where, what’s important in her life. (Sure, it’s Joel, but it’s also guns, loot, and not turning into one of those things – because she’s a badass!) I would play the hell out of that game. In the beginning, Lara goes to Siberia, but only after Jonah agrees to be her chaperone. At the end, all too predictably, Lara smashes the thing she has spent the entire story trying to find. Why? Jacob Prophetface said it was “okay” to do it. “Remember, that the extraordinary is in what we do, not who we are,” says ghost dad’s recorded voice during the epilogue. End spoilers. For that matter, end article, too.